Spaghetti and Meatballs | Time to Cook! 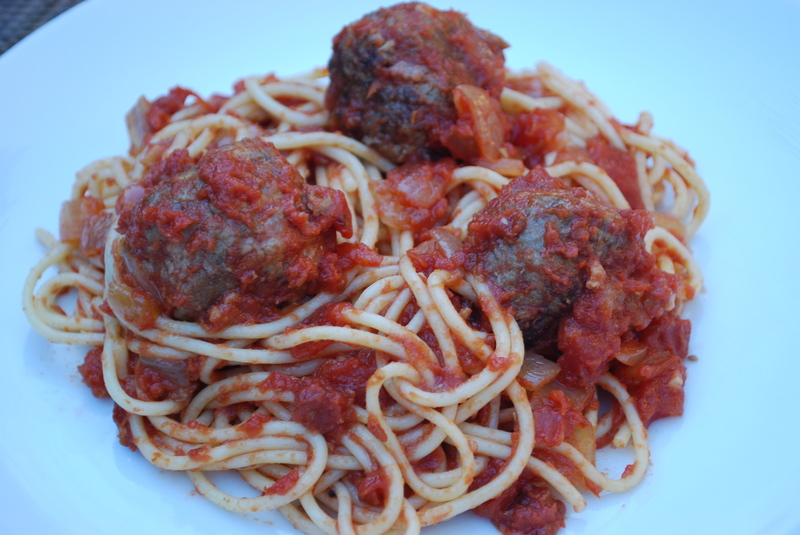 I love this very simple recipe for spaghetti and meatballs. Next time, I would make twice the amount of sauce. I don’t think I would ever tire of this ultimate comfort food. Recipe from The Saucy Apron. Puree tomato in blender. Cook onion and garlic in oil until soft. Add tomato, pepper and bay leaf, salt and pepper. Bring to a boil then simmer for 30 minutes. Using your hands mix beef, bread crumbs, cheese, oregano, garlic, egg, salt and pepper. Roll into large ping pong balls. Now fry the meatballs until brown then simmer in the sauce until the inside is no longer pink. About 30 more minutes. Stir a few times while cooking. Serve over spaghetti with a big glass of red.